Roboclean Home Cleaning System for Hay Fever sufferers! Hay fever is inflammation of the nose, which is recognized by symptoms such as sneezing, runny nose, blocked, stuffy nose, itching and 'post-nasal drip' (mucus running down the back of the throat). It can occur in association with inflammation of the eyes or sinuses. Hay fever, pollenosis or Allergic rhinitis is an allergic inflammation of the nasal airways. Rhinitis can have several causes, such as infection, a reaction to medication, irritation by dusts, or allergy. Allergic rhinitis is caused when the body mistakenly makes allergic antibody to a substance such as pollen, house dust mites, cat, dog or moulds. Symptoms that continue all year are called perennial allergic rhinitis and commonly relate to indoor allergens, such as house dust mites, pets and indoor moulds. 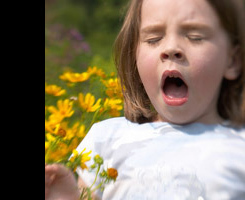 People who suffer Hay fever are at increased risk of developing asthma. For a cleaning system to be effective for people with hay fever, it needs more than just a HEPA filter. Just as important most vacuum cleaners use bag or filters (dust-bag, upright or cylinder models) and eventually in time they loose their suction and air flow. This is because they use different kind of filters (even cylinder models) but same kind of filters which in a short time gets blocked by small dust particles. Roboclean uses water as a filtration system which has no possibility of getting blocked as all dust particles are sucked straight into the water base. As Roboclean is based on the principle of “ Soaked Dust Can't Escape”. Roboclean cleaning system has advanced separator technology and water-based filtration technology to keep all dirts, dust and allergens in the water and for no loss of suction. Roboclean cleaning system can capture particles down to 0.3 microns – including pollen, mould, mites and bacteria. Rather than enjoying a healthy life, if you are experiencing hay fever or allergic rhinitis,BOOK your FREE home demonstration NOW!